Getting ready to walk down the aisle? Have your wedding rings make their procession with love and care on this hand embroidered ring pillow. Whether you attach the actual rings or substitutes for show, this cushion will be a wedding item you'll cherish. 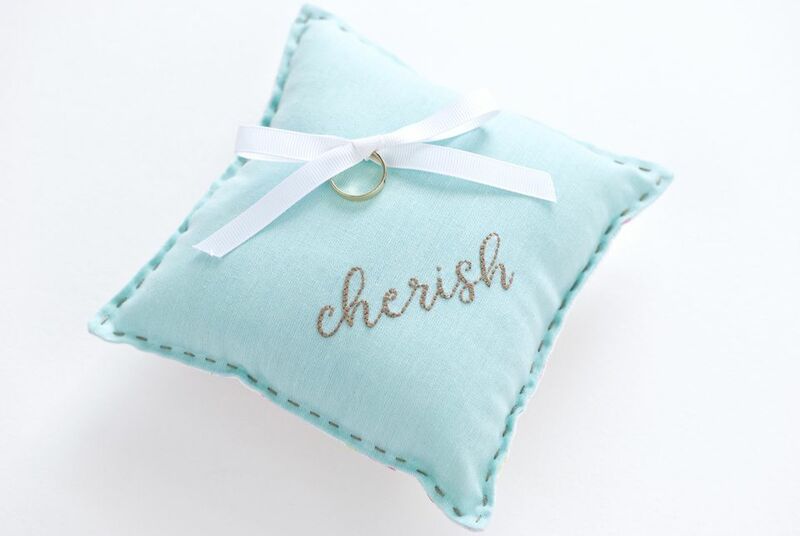 Making your own ring pillow means you can customize the colors and fabric to match your wedding style. It's also an easy project, so it won't add too much stress to the planning. The embroidery can be finished in an evening and the sewing takes even less time. If "cherish" isn't the word you'd like, you'll also find free patterns for "always" or "forever." Of course, you can change out the words for another design, such as a spray of flowers (the posy on this Welcome pattern would work well). A note about the fabric squares: The top and bottom of the pillow can be different fabrics, but the top piece should be suitable for embroidery. A solid or subtly printed quilting cotton is a good choice, as long as your stitching will show. Download the JPG file of the "always, cherish and forever" patterns and choose one of the words. If you print the file to fit on a standard page, it should come out at the right size for your pillow, but you may wish to adjust the size. Turn the top fabric square on a diagonal and use a water-soluble marking pen to trace the pattern a little below the center. It's important that the embroidery doesn't go too close to the edge of the fabric so that a seam allowance remains and so that you can still work in an embroidery hoop. Embroider the word with 3 strands of embroidery floss. Stitch over the lines with back stitch. On the downstroke of each letter, the lines are double to make those lines thicker. Keep the lines of stitching close so there is no gap between them. Remove the pen markings by soaking the embroidery. Let it dry and then iron it carefully. Fold the ribbon in half and place the middle so it is centered horizontally, but just above the middle of the embroidered square. The ribbon should be vertical as shown in the photo. This will make the bow in the correct direction when you are finished. Stitch the center of the ribbon to the fabric with matching embroidery floss and a few back stitches. Tie the ribbon in a bow or roll the ends together to keep them in the middle of the square. Pin the fabric squares right sides together, marking where the opening will be. Sew around the sides with a 1/4 inch seam allowance, leaving a 2 inch opening. Backstitch on each side of the opening. Clip the corners and turn the pillow right side out, pushing the corners into shape with a chopstick. Fill the pillow with stuffing so that it feels full, but not overly firm. To reduce lumpiness, use small pieces of stuffing as you work. Stitch the opening closed with ladder stitch (you can find a guide for ladder stitch in step five of this tissue case project). Give the edge a finished look by topstitching around the sides with three strands and running stitch. To do this, roll the seams a little between your fingers to open them. Then, hold the edge so the stuffing is pushed in a bit as you stitch. Your stitching should be about 1/4 inch from the seam. To tie your rings to the pillow, slide them over one of the ribbon ends. Position the pillow so the embroidered word is facing away from you and tie a standard bow. Make the loops as even as possible, and if necessary, trim the ends of the ribbon.